In 1860 dry goods merchant John Martin, Jr. diversified into real estate. That year he acquired three old structures-including Kohler & Brunjes’ grocery store at No. 82 Reade Street-- at the northeast corner of Church Street, and laid plans for a rental building. It would appear that he chose James H. Giles, who was active in the area at the time, as his architect. The design of the Italianate-style five-story loft and store building, completed in 1861, was handsome and up-to-date. The red brick façade was trimmed in contrasting stone. Especially eye-catching were the second floor openings, copied at ground level on the Church Street side. The round-headed windows here were capped by carved eyebrows with paneled keystones. The tall cast iron storefront featured fluted Corinthian columns supporting its entablature and cast cornice. Among the architect’s details--like delicate sill courses—was his delightful attention to the structure’s corner, which turned in rather than pointing out. The architect indented the corner of the building--a subtle touch. Among Martin’s first tenants were Giles Brothers, wholesale dealers in hosiery and woolen goods; George M. Richmond & Co., “domestic dry goods;” The French Self-Fastening Button Co.; and William B. Watkins’ store. In 1865 a 23-year old German immigrant, William B. Gerslenberg, worked for William Watkins as a bookkeeper. Perhaps because Gerslenberg had access to the company safe, another employee, Charles Smart, gave him $284 of his own money for safekeeping. Problems for both men started when Watkins fired Gerslenberg. 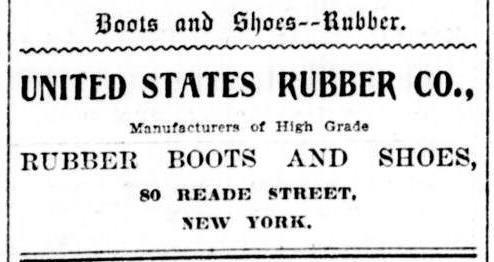 A far different type of business—the rubber goods industry—was represented in the building by the 1890s. Although the Mack Drug Company, “dealers in patent medicines,” was still in the building in 1890 after several years here; it was also home to the Boston Rubber Shoe Co., Ford Brothers “rubber goods,” and the Home Rubber Company. 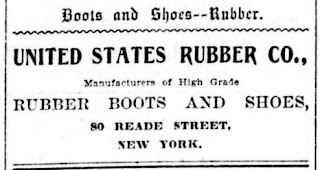 The Ford Brothers firm consisted of wealthy “india rubber merchants,” James B., John R. and J. Howard Ford. The brothers lived together at No. 507 Fifth Avenue. And the Home Rubber Co. would remain in the building at least until the end of World War I. In 1911 the building was joined internally with No. 78, the L-shaped structure next door that wrapped around to Church Street. It was about this time that Robert J. Pierce’s son, Clifford A. Pierce, had taken over control of the business after he had his father declared insane. In the 19th and early 20th century, insane asylums were not only a means of dealing with the mentally ill; they were a convenient method of getting rid of cumbersome relatives. The problem was such that in 1891 the Lunacy Law Reform League was established. Clifford Pierce repeatedly had his father committed, but Robert Pierce was always released. In 1917 the elder Pierce was confined again, this time in the Bloomingdale Hospital for the Insane. On July 21 that year, he saw his chance and slipped a note to a little girl, the daughter of Dr. and Mrs. A. I. Bernstein of Mt. Vernon. The note pleaded for his attorney, Jacob S. Ruskin, to obtain a review of his case. The Sun later reported that “The note was forwarded to the lawyer, a review was obtained and four physicians testified that he was sane.” Pierce was released. But his freedom would be short-lived. Clifford Pierce told authorities that his father “underwent another nervous breakdown and created a disturbance.” The elderly man was returned to Belleview, but released two weeks later on August 22, 1917. The next day, according to Clifford, “his father came to his place of business and grew troublesome.” The wealthy and respected old man who had established the drug firm was sent to a sanitarium in Flushing, New York, for treatment. Also in the building about this time, along with the Home Rubber Co., were the C.P.N. Chemical Co., dealers in in 1918; and the Abrams-Radner Shoe Co., Inc. “wholesale shoes.” Later in the century the railroad supply firm, John W. Miller Company, would be here, as well as the Good Neighbor Textile Company and the Bailey Chair & Supply Co., Inc. In 1993 the upper floors were converted to apartments and today the ground floor is home to a trendy restaurant. John Martin Jr.’s venture into real estate development is astonishingly little changed after a century and a half. The James L. Graham House -- No. 21 Washington Square No. In 1835 Edmund Wilkes began construction of three adjoining houses on the northern side of Washington Square. George P. Rogers set the tone of the Washington Parade Grounds when he erected his lavish home in 1828-29—the first residence on the square. Now Wilkes joined the trend by building Nos. 21 through 23. Completed in 1836 they were high-end Greek Revival residences intended for wealthy homeowners. Like its neighbors, the stately architectural features of No. 21 announced its tony status. The exceptional ironwork and parlor floor balcony, the refined Ionic portico, and the ornamented fascia board below the cornice boasted that its owner could afford extras. The high-end ironwork included not only the handsome fencing, but the exceptional balcony with its large, elaborate wheel designs. James and Julia Graham had three sons—Henry Beekman Graham, James Lorimer Graham, Jr., and Robert McCoskry Graham—an adopted daughter, Rebecca, and daughter Mary. When Mary married politician Joseph B. Varnum, Jr., the newlyweds moved into the Washington Square house; as did Rebecca and her new husband, Samuel Dexter Bradford, Jr., following their marriage on January 11, 1859. By now the Graham sons were all working with him at No. 108 Broadway, home of the Metropolitan Insurance Company, of which Graham was President. James Jr., who had moved out and was living at No. 4 Washington Square, held the position of 2nd Vice President; and Robert was Vice-President. When Julia Graham’s 73-year brother, James McCall, fell ill in 1864, he, too, moved briefly into the house. McCall had been President of the Metropolitan Bank and a partner in James McCall & Co., but had retired years earlier and left the city. But he returned during the summer of 1864 “to take medical advice.” Diagnosed with “asthma of the heart,” he was brought from the Clarendon Hotel to the Graham house. Here he died on Thursday, August 11; and his funeral was held in the drawing room the following Saturday. In 1872 James L. Graham hired builders John T. Conover and E. & W. N. Dobbs to construct a one-story brick stable at the rear of the house. But before long he would have more pressing problems than housing his carriage and horses. In February 1858 Elizabeth had inherited about $70,000 from her husband’s estate, including real estate. It was a sizeable amount—translating to more than $2 million today. Before Elizabeth made an extended trip to Europe, she turned her affairs over to Graham. When he asked her to sign a paper, she did so without reading it, in complete trust. It was an absolute power of attorney. Elizabeth received income from her holdings and had no reason to question Graham. But when she received a notice from the Sailor’s Snug Harbor that the taxes on a house she owned on 19th Street had not been paid for six years, she headed to No. 21 Washington Square for an explanation. Elizabeth sought out an attorney, who gave her bad news. “I found that he was pressing claims of other relatives against the same defendant, and had obtained from the defendant a mortgage upon his household furniture, ornaments, pictures, bronzes, &c., to secure those claims.” She told officials in February 1878 that she was nearly broke. On February 19 an order for Graham’s arrest was granted. James Lorimer Graham had fallen victim to a not-uncommon 19th century situation. In order to keep up the appearances of prosperity, he had turned to crime. The convenience of reporting “at homes” was not shared by General William Tecumseh Sherman. On February 2, 1891, in a letter regretting he could not attend the Posts’ dinner that Saturday, Sherman mentioned to Mrs. Post, “Of course I was sorry to miss you on my last two calls, but the trust is I cannot keep the run of ladies’ days and I have been trained to believe a man belittled by running after what are termed ‘teas.’ I prefer to take my chances, and will surely catch you in some time. The Posts did not participate in the New York’s winter social season of 1899-1900. Like many wealthy families who took extended trips, they leased their home that winter. Their tenant, lawyer E. S. Rawson, was best known to Newport society, where he maintained his cottage, Avalon, on Ocean Avenue. The Posts were back the following winter, and Mrs. Post resumed her routine of entertainments, like the “luncheon party” she held on Tuesday, February 5, 1901. Then in June 1919 Pepe & Brother brokered the sale of the house to actor E. H. Sothern and his wife. Newspapers were more interested in Mrs. Sothern, who was the famous stage actress Julia Marlowe. The couple had appeared together on stage before their marriage; but it was Julia who achieved the most fame. 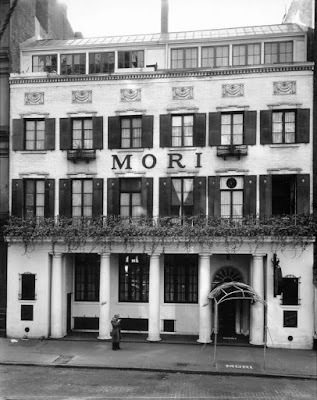 Since 1883 Mori had operated the well-known Mori’s restaurant nearby on Bleecker Street. He moved into the Washington Square house and continued to run the restaurant, despite the problems of Prohibition. 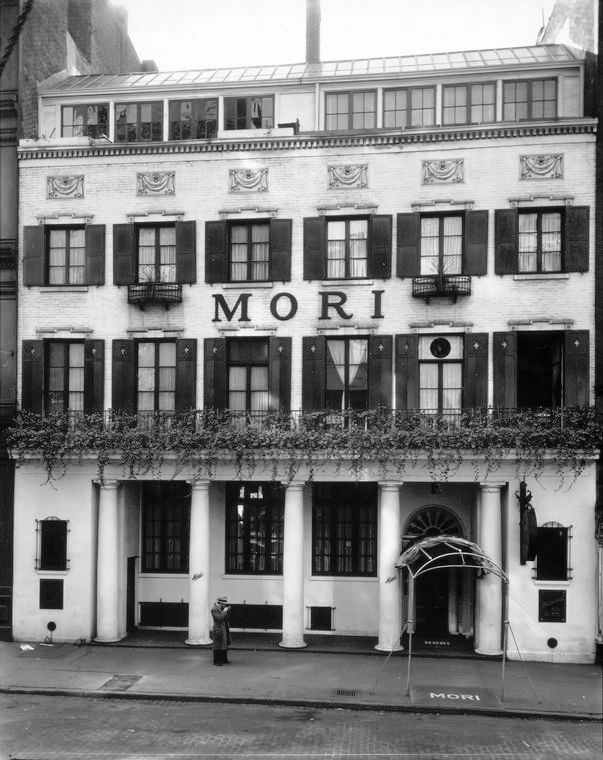 On Saturday night, January 13, 1923 the 54-year old Mori did not come home. That night police, armed with a search warrant, raided the restaurant. They “seized fifty-eight bottles of wine and ten bottles partly filled with whisky,” reported The Times. Following Mori’s arrest, they went upstairs to the apartment of Louis Funai where they removed 18 bottles of champagne, 247 bottles of wine, 15 bottles of gin, 4 bottles of kimmel and one gallon of wine. Police estimated the valued of the liquor at $10,000—in the neighborhood of $140,000 today. Among the residents in the converted Washington Square house by 1938 was former war correspondent Jay Allen. That year he hosted an internationally-known house guest, Spanish artist Luis Quintanilla. Considered one of Spain’s foremost artists, he had given up painting to fight for the Loyalist forces after insurgents destroyed most of his life’s work. Quintnilla had brought with him 60 sketches of prison life. He had done them while imprisoned for seven months on a charge of harboring four Socialist friends in his studio during the October 1934 Revolt. In 1942 the former mansion was converted to seven apartments, while preserving the historic façade. It enjoyed the cinematic spotlight when it was used as the home of Albert Finney’s character, Dr. Sloper, in the 1997 film Washington Square. Outwardly little changed, No. 21 is a fine example of the elegant lifestyle of the residents of Washington Square in the 19th century. Since the opening of the Second and Third Avenue elevated trains a decade earlier, development in the area had burgeoned. The Walsh brothers would get into the act with their dozen upscale homes which stretched from No. 116 to 138 East 95th Street. The houses were completed in 1888. C. Abbott French’s picturesque row was a visual delight of Queen Anne oriels, quirky openings and terra cotta ornaments. No two homes were exactly alike, yet they worked together to form a pleasing whole. Buyers began to take interest; but not quickly enough for the Walsh brothers. There was the issue of that $10,000 loan. On November 30, 1889 the Real Estate Record & Builders’ Guide noted that two of the homes, No. 136 and 138, were taken in foreclosure by Matthew C. Henry and his partners, Joseph A. Weeks, Jr. and John Gaynor. It was a splendid turn of events for them—the two vacant houses were valued at $14,000 each. Nevertheless it would be a year and a half before M. C. Henry & Co. found a buyer for No. 136. On June 30, 1891 Moses Baumgarten purchased the house for $17,500—about $470,000 in 2015 dollars. The 18-foot wide house was faced in yellow brick. A stone dog-legged stoop rose to the parlor floor. The second floor was dominated by a massive arched opening, its keystone sprouting the base of a Juliette balcony. On either side somber faces stared down from large terra cotta medallions. Above it all was a Flemish stepped gable, supported by a brick corbels. The Baumgarten family was well respected and well-to-do. Moses owned a successful bakery and dabbled in real estate. He and his wife, the former Louisa Schlossheimer, were married in 1872 and had three children, Benjamin, Rae and Carrie. Their place in Jewish society was highlighted when Rae married Adolph Levy on November 9, 1897. The New York Times reported “A wedding that aroused considerable interest in Hebrew social circles was that of Miss Ray [sic] Baumgarten…and Adolph Levy of this city, which took place in the Madison Square Garden Concern Hall.” A reception dinner for 250 guests followed. The Baumgartens remained in the house at least through 1919, before selling to Gustave Dauer. Incidentally, while Moses Baumgarten died in 1929, Louisa lived until 1958 having reached the age of 104. Dauer resold No. 136 to Isaac Cohen in 1921, who made “alterations.” It may have been at this time that the stoop was removed and the entrance lowered to the basement level. An iron railing most likely finished the tiny balcony at the third floor. By the late 1920s it was home to the family of trial lawyer Albert Stickney. Daughter Elizabeth Weston Stickney was educated in the prestigious Chapin School and was a member of the Junior League. On March 12, 1929 the Stickneys announced Elizabeth’s engagement to investment broker William Ogden McCagg. The McCagg family had homes in New York and Newport, and William (he would later be known as W. Ogden McCagg) had attended St. George’s School in Newport. Truslow and his wife, the former Elizabeth A. Jennings, had four children. They maintained a summer estate in Cold Springs Harbor, Long Island. In December 1946, five months after moving into the house, he was elected President of the New York Curb Exchange. The family closed the 95th Street house on July 1, 1951 as they boarded the liner Argentina headed for Rio de Janeiro. Truslow had been appointed head of the United States-Brazil Joint Commission for Economic Development by President Truman. Francis Truslow would never make it to South America. Eight days into the voyage Elizabeth found her husband dead in their cabin. The athletic 45-year old had died in his sleep. No. 136 East 95th Street continued to be a single family residence; becoming home to Robert Yost Hinshaw and his wife Lillias. Hinshaw was a public relations executive and consultant. The religious dynamic of the Hinshaw household was interesting. Robert was a Quaker. And Lilias (who, incidentally, was the daughter of John Foster Dulles, Secretary of State) was graduated from the Union Theological Seminary in 1958 as a Presbyterian minister. The Hinshaws had four children—two sons and two daughters. Daughter Janet met and married Hyon Yoo while she was studying at Columbia University. Yoo, 22-years old, landed a job as Professor of Economics at Seoul University in 1959. He moved to Korea and Janet, pregnant with their first child, planned to join him later. Janet moved into the East 95th Street house with her parents and in January 1960 gave birth to David Hinshaw Yoo. By December little David was old enough to undertake the long trip to Korea to join the father who had never met him.